Popcorn is a whole grain snack that is really low in calories and has that great crunch we crave. But, the packaged stuff in the supermarket is expensive and can be high in sodium. 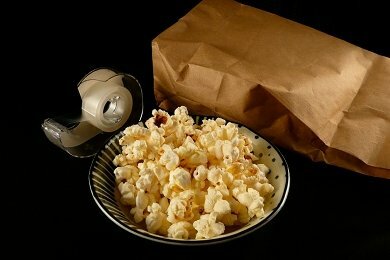 How you can makeover packaged popcorn? You can make popcorn in the microwave without the prepackaged products from the supermarket. All you need is popcorn, lunch bags, tape, and some flavorings. Ordinary popcorn is about $1 a pound and you will get about 8 servings. ($6 as versus $1 - you save $5!). You will save a ton of money for just a little work. But, even if it costs more to pop your own, there is concern about a chemical that is released when microwave popcorn is popped. So, since you didn't add ANYTHING but popcorn, your microwave popcorn is anxiety free! Place in microwave folded side upfor 2 to 3 minutes or until there is 5 seconds between pops. What about flavorings? Well, the great thing here is now you aren't stuck with the choices in the packaged microwave popcorn. In the book, "Popcorn", Patrick Evans-Hylton, writes about all sorts of things you can add including sugar (to make a carmel-corn taste), ginger and wasabi, and even BBQ sauce. His ideas are fantastic and enough to inspire any popcorn aficionado. Instead of tap, you can use 2 staples placed at least 1 inch apart on the bag. Works great. No sparking from the microwave. Learned this trick from Alton Brown's cookbooks. According to Wikipedia, the kernels need to get to 180C (356F) to pop. There is also a wealth of information at www.popcorn.org. can pop corn the old fashioned way: in a pan on the stove. rest of the popcorn, cover the pan and shake to evenly spread the oil. When the popping begins to slow, remove the pan from the stove-top. The heated oil will still pop the remaining kernels. Funny thing...you don't need any oil for stove top popcorn. I've been popping my popcorn this way for a couple years now. You do it the same exact way..just skipping the oil step. I have a Back To Basics microwave popper that can be used with or without oil. I use it without oil and it comes out great. Sometimes I'll drizzle some olive oil (about a teaspoon) on it after popping. You can also use an olive oil mister to spray just a bit of oil on it to get salt to stick to it. I also like to drizzle maple syrup (about 2 teaspoons) and then sprinkle with some sea salt. This is just like kettle corn! Old Bay seasoning is also yummy! This is awesome! I love popcorn, but don't always feel like popping it on the stove and microwave popcorn can get to be quite pricey. Thanks for posting this! I've done this before and it totally works! This is AWESOME! I have an air popper, but this is great for when we're traveling and there's a microwave in the hotel room! I LOVE drizzling agave with a little salt over my popcorn - it's just like kettle korn!! What an easy way to do it. I'm going to try some wasabi flavored popcorn tonight. I bought an air popper because I thought it would be healthier but the popcorn wasn't as good as microwave variety. I have all the popcorn I bought (and I tried so many kinds - even Black Jewel) and was ready to give them away. This is awesome -- saving money AND calories -- I love it! Tweeted a link to this. : ) Keep up your good work! Love Love Love this idea - I'd heard of others doing this before, but didn't know how. So simple. OMG, what an awesome idea. I just made some for my boyfriend and He loved it. Said that it was delicious. Also, a question. Can't you add the flavours before you pop the popcorn? It doesn't work when I add the flavours after..